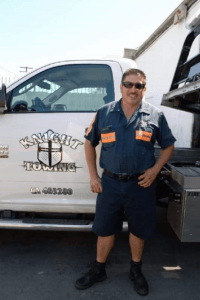 Knight Towing is a locally owned and operated towing company, since 2002. A courteous professional tow truck operator is available to provide towing and road service 24 hours a day, 7 days a week, 365 days a year. Knight Towing is fully licensed and insured. Our tow truck operators are careful to ensure no damage is done to your vehicle as we hook it up and take it away. 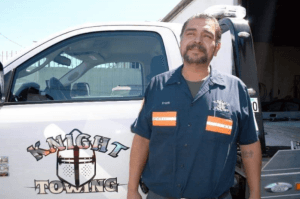 At Knight Towing, our customers and Community have been essential to our success, therefore we understand the importance of giving back to the community and we work hard to do so. We serve by sponsoring multiple organizations and it gives us great pleasure being in a position to contribute to the community we love. Abraham is quick and efficient with all your towing needs. Having years of experience behind him, feel at ease knowing your car is in good hands. 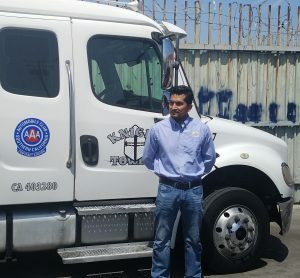 Manuel always ensures a pleasant experience with a clean tow truck that smells like an island breeze. Needless to say, expect a paper floor mat on a rainy day. Frank is a local, raised in Santa Ana, and knows Orange County like the back of his hand. You don’t need a GPS with this man around. He’ll arrive quickly and help you get on your way. Arnold always shows up with a smile. 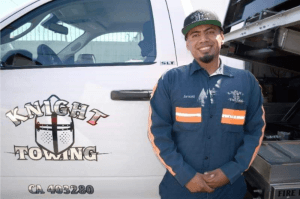 When you’re bummed out over your car troubles, he dedicates himself to giving you a good experience with Knight Towing. 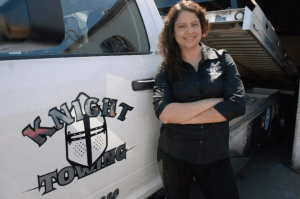 Mayra gives Knight Towing a lady’s touch. She will gladly assist you with any quotes, questions, or concerns you might have.